311 is Baltimore’s number to call for all city services. All calls to 311 go through a One Call Center, a 75-agent, 24 x 7 x 365, in-bound call and dispatch center. The 311 system uses CitiTrack technology – customer relations management (CRM) software that provides for both centralized and distributed call-intake and work order management throughout the City. It was up to the Mayor’s Office of Information Technology (MOIT) to understand and implement Mayor O’Malley’s vision of a customer friendly city. It must provide management information tools to make sure the work gets done on a timely basis. A call center would make call-intake consistent and independent of any agency. MOIT’s approach to the challenge was to go out and find a City, similar to Baltimore, who was doing CRM right and copy it – in short, learn from someone else’s mistakes. The city was Chicago and the system was SunTrack from Motorola. To ensure SunTrack was right for Baltimore, with minimum cost liabilities, MOIT worked out a no-risk pilot program at the vendors cost. Now called “CitiTrack” the system was launched as three-month, DPW limited implementation to handle customer call-intake and track problem resolution for a significant part of the Agency – Mayor O’Malley’s 48-hour pothole guarantee, the tracking and removal of steel plates and to organize bulk trash requests. From what MOIT learned in DPW, CitiTrack was slowly grown throughout the rest of city government. Near the end of the full agency deployment, the city had developed nearly 300 service request types and today 1000 personnel are using the system across the City. March 25, 2001 – The 311 One Call Center is fully operational joining existing police and fire emergency communications facility at 601 E. Fayette St. 311 is staffed with existing City call-takers, relocated from other City operations, as well as new hires. 311 is meeting current demand and call volume with trained customer service agents. The operation will grow incrementally as word gets out and demand for the service increases, where available new personnel and resources will come online. Professional in-bound call center responding to as many as 5,000 calls per day. 24 x 7 x 365 call-intake and dispatching operations. 75-person customer service agent and dispatch staff supporting city services. Three shifts manned, personnel distribution by shift: day - 85%, evening - 12%, overnight - 3%. 34 Customer Service Agent workstations with expansion capability to add ten. 300 services request types with predefined scripting and work activity flow. State-of-the-art computer and telephony infrastructure with emergency backup facility power. Utilizes CitiTrack, a standardized, real-time, inter-agency customer relations management (CRM) application deployed to nearly 1000 agency management and operations personnel. With the consolidation into the One Call Center, approximately 50 customer agents now handle the same volume of calls handled by equivalent of 125 positions throughout city government. Direct feed to CitiStat for follow-up. Major agencies/bureaus participating include DPW, Office of Transportation, Health, HCD, Mayor’s Office of Constituent Services, Recreation and Parks, Mayor’s Office of Information Technology, City Council, the Municipal Telephone Exchange, and others. The CitiTrack Customer Service Request system is available from 1,000 locations on the City network. 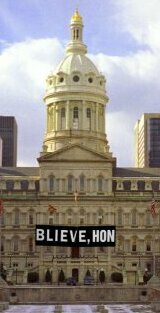 Click image for the Baltimore City web site. Report an Abandoned Vehicle on public or private property. Report dogs barking on private or public property. Enforcement Officer is assigned to inspect complaint. After assessing complaint, Officer may call for assistance from fellow officers. Owner of animal may be given citation. Report animal roaming in public space without leash or owner present. Call 311 to report aggressive animal chasing or attacking people. Upon investigation, animal owner may be issued citation and/or animal may be collected. Request removal of sick animal no one wants to keep. Enforcement Officer will be dispatched as situation demands and as staffing and workload allow. Owner of animal may be given citation. Report stray animal which has been detained or trapped. Upon investigation, animal will likely be collected. If applicable, animal owner may be cited. Report animal waste left in yard, foul odor from interior of house where animals are kept, etc. Enforcement Officer will be assigned to investigate complaint. Owner of animal or property may be given citation. Request to address ball field maintenance where grass needs cutting, fields lined, water removed from infield, or goal posts removed/ placed on field. Any request of a safety concern, broken equipment, protruding pieces that could cause injury should be called in to 311. Schedule pickup of bulk items per following: must schedule 3 business days prior to pickup; no more than 3 items; up to 4 tires w/o rims, but no other auto parts; no building materials (including paint, flammable or hazardous waste); place items at regular collection location; if rear collection, leave gate unlocked and items within 3 ft. of gate; place items out by 7AM on pickup day; and, keep pets in house. Report problem with City pool. City crew will be assigned to assess and repair problem. If problem involves break-in and vandals remain on premises, please call 911. Report and request removal of dead animal from public right-of-way or private property. City will remove dead animal. Report and request removal of trash and garbage from public alley. Upon assessment of complaint, City will clean alley. Request dirty street be cleaned of trash and/or bulk items. Upon assessment of complaint, City will clean street. This type of service request is NOT for mechanical sweeping. Report complaint regarding restaurant, grocery store, cart, or other food service facility. Health Department sanitarian will be assigned to investigate complaint. Sanitarian performs an inspection of facility before determining final disposition. In some cases, facility operator may be given citation and/or facility may be shut down. Request repair to footway/ sidewalk on city street - (footway may be broken, cracked, or chipped.) After assessing problem, City will perform necessary repairs to make it safe. Violation notice may be issued if property is privately-owned; resident or business owner would either repair footway/ sidewalk or pay city to perform work. Request removal of stump from dead City street tree. City of Baltimore does not remove stumps from privately-owned trees. Stump removal request is normally created in-house after removal of City tree. Inspector will be assigned to schedule removal. Request pruning of City-owned tree. Request is usually associated with low limbs, dead wood, intrusion on private property, obstructing right of way views, traffic lights and signs etc. City of Baltimore does not prune privately-owned trees. Removal of dead City street tree from City-owned property. City will not remove live trees or trees from private property, all trees not in the median strip or next to curb of street are responsibility of property owner. Upon investigation, emergency condition will be corrected on priority basis; otherwise, tree is posted for removal and work will be scheduled appropriately. Report and request removal of graffiti. Upon assessment of complaint, City will determine optimum removal method (e.g., painting, sandblasting, etc.) and dispatch appropriate resources. Graffiti removal from private property requires owner's written consent. Request to have grass cut on City-owned property. After assessing problem, City will schedule grass to be cut. Report high grass and weeds (8" or higher) on private property (occupied or vacant) or lot. Upon investigation, violation notice and/or fine may be issued to property owner. Generally, it is not responsibility of City to clean or maintain private property. Baltimore City has already set a new standard for urban management and accountability with CitiStat. Today, Mayor Martin O’Malley launched a new central intake call system for all city service requests that completes the circle of efficient, customer friendly government. 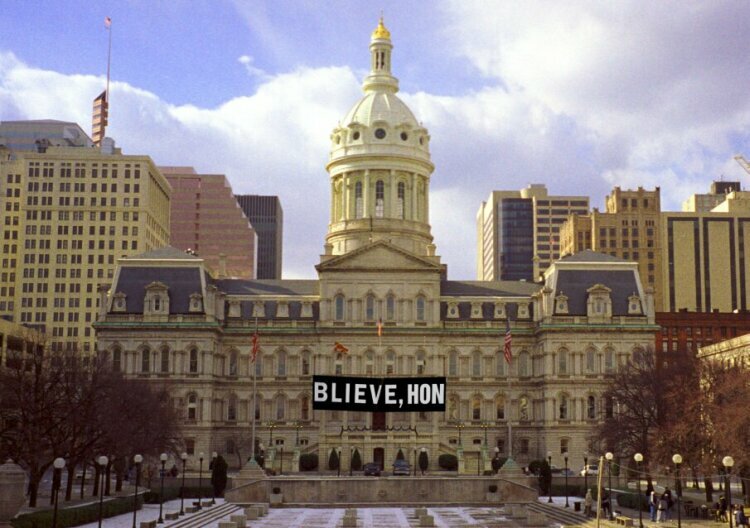 311 is now Baltimore’s call to City Hall. Beginning today, city residents can access city services more quickly and easily than ever before. All services - from scheduling a bulk trash pick up or repairing a pothole, to reporting a water main break or a streetlight outage - are now just three numbers away from anywhere in the city. In his first State of the City address, Mayor O’Malley unveiled plans for CitiStat, a data based management system built on accurate and timely intelligence, rapid deployment of resources, effective strategies and relentless follow-up. CitiStat has since become City Hall’s main tool of accountability. If CitiStat is the back-end of effective management of resources, CitiTrack and 311 are the front-end. Together, they are efficient, effective and accountable government. The 311 One Call Center utilizes CitiTrack, a customer relations management (CRM) software system. CitiTrack is much like the CRM systems used by telephone and electric companies to not only deliver, but also measure how good their customer service is. And just as UPS or FedEx do with their packages, each citizen calling into 311 is given a tracking number so that it is tracked from the moment the request enters the system, all the way through abatement. The center will utilize three shifts of trained customer service representatives 24-hours a day, 7-days a week. To ensure uniform service there are 300 preprogrammed service request types, covering most citizen needs. Each request type is scripted with a basic set of questions, which the city’s customer service agents use to get accurate information and ensure uniform service. Requests are then routed directly to the field through the CitiTrack computer network for service. Finally, the request is sent to CitiStat, to ensure proper follow-up. The 311 One Call Center is engineered for response to as many as 5,000 calls a day. With a state-of-the-art computer and telephony infrastructure with emergency backup facility power, the 75 member staff is trained to provide residents with the most accessible method to request services. Report Residential, Interior or Exterior rodent or mouse infestation. Department of Housing Inspector will be assigned to investigate problem. After assessing situation, violation notice may be given to property owner. Note: Use Rat Rubout Request to ask for City’s help in eradicating rodent infestation. Report exterior or interior structural deficiencies associated with private residences (e.g., roof, stairs, cornice, walls, ceiling, floors, porch, railings, etc.). Upon investigation, violation notice and/or fine may be issued to property owner. Generally, it is not responsibility of City to clean or maintain private property. Report Residential lack of proper trash containers - Accumulation of trash, debris and bulk items on vacant or unoccupied private property. Department of Housing Inspector will be assigned to investigate problem. Fine or Violation Notice could be given. Note: Please report trash and can issues on occupied property using Sanitation Enforcement service request. Report Residential overgrown trees or shrubs that block sidewalk traffic or do damage to adjacent property (encroachment). Department of Housing Inspector will be assigned to investigate problem. Violation notice or fine could be issued. Report Residential property issues that concern plumbing, electrical, and mechanical problems - no heat, water or electric (required utilities). Department of Housing Inspector is assigned to investigate problem. After assessing situation, determination is made whether fine should be issued. Note: “Notice to Vacate” letter may be served and filed with court through City of Baltimore Legal Department and Sheriff’s Office. Report residential property which has become open to casual entry by public and represents hazard to community. Upon investigation, City may request owner to board property within designated period of time. If owner does not comply, City may pursue further action against property owner. Report suspected illegal parking. Inspector will investigate and possible outcomes may include ticketing, towing and impoundment, referral to Police, etc. Questions concerning residential parking permits should be forwarded to Parking Authority of Baltimore City (Telephone: (410) 396-6975; E-mail: Parking Authority). Complain about illegal signs installed on Public right-of-way. City will dispatch crew to remove signs. City cannot remove signs from Private property. Report and request removal of trash and debris from City-owned lot. Upon assessment of complaint, City will clean lot. If lot is determined to be privately-owned, service request will be transferred to Housing and inspector will investigate and may issue violation notice and/or fine. Report missed scheduled trash pickup. In most cases, trash is picked up following day. Only 4 cans per household and place cans out by 7 am. If in rear, leave gate unlocked & place cans within 3 ft. of gate. Please keep pets in house. Report missed scheduled recycling pickup. In most cases, recycled items are picked up next business day. Alert City that water is flowing from hydrant nozzle (usually opened by unauthorized residents during summer months). Water Scout is assigned to inspect and shut off open hydrant nozzle. Request maintenance at particular public park or on park structure, such as a Pavilion or a gazebo. Park Maintenance handles outside repairs (i.e. new net and/or repair to tennis/ basketball court, fences, bench repairs, request for new benches, masonry work, water fountain repairs, and water leaks). Request to have parking meter investigated for malfunctions and/or sign posted on meter. Department of Transportation Investigator is assigned to assess complaint. Investigator will call in Transportation Maintenance Crew for repairs or sign shop to install another meter or sign. Request to address all playground issues i.e. repairs of swings, playground equipment, fencing, painting of equipment and adding mulch or wood carpet to playground. Any request of safety concern, broken equipment, or protruding pieces that could cause injury should be called in to 311. Report pothole on public street or alley. City will repair most potholes within 48 hours. Report rat/mice infestation on property’s exterior. City will use chemicals to treat rodent infestation. Property owner may be required to permit access to his property for purposes of investigation and treatment. Request Recycling Pickup Schedule. Recycling Office will mail schedule within three business days. Schedule is also available on the web: Recycling Schedule. Request Sanitation Enforcement Officer investigate location for improper sanitary conditions. Upon investigation, SEO may issue citations and/or fines to property/ business owner. In some cases, SEO may coordinate clean-up of area. Report any general sewer related issues. City will investigate and correct problem. Report sewer water backup in cellar or basement. Upon investigation and determination water backup is City’s responsibility, maintenance repair crew would correct condition. In some cases, water backups are responsibility of property owner. Report snow/icy condition which could cause injury or inhibit movement of traffic. City road crew is dispatched to resolve condition. Report storm inlet which is blocked, filled with debris or not draining properly. Upon inspection, City will clear blockage and repair any damage to inlet. Report broken or missing inlet grate, manhole cover or damaged inlet opening. Maintenance Repair Crew is assigned to inspect complaint. Depending on results, he/she would assess damage and make necessary repairs. Report streetlight outage. Streetlights are maintained by either City or BG&E. City will repair or coordinate repair of all public street lights. Request repair regarding material condition of street, such as cracking, sunken, raised, or sinkhole etc. - exclusive of potholes. Department of Transportation Highway Maintenance Supervisor is assigned to assess problem. After assessing problem, Supervisor will issue service request to Transportation Maintenance Crew for repairs. Request traffic sign be changed (i.e. No Parking to No Stopping). Investigator will be assigned to assess complaint. If Investigator agrees sign needs to be changed, new sign will be installed by Sign Installation Crew. Report previously existing traffic sign is missing from specific location. Note: Please call 311 if Stop sign is down or missing! Investigator will assess complaint, if Investigator agrees sign is missing, new sign will be installed. Request traffic sign be installed at location where no previous sign existed. Investigator will be assigned to assess request. If Investigator agrees new sign is needed, new sign will be installed. Report traffic or parking sign has been damaged. Department of Transportation Investigator is assigned to assess need. If it is verified sign is damaged, an internal ticket is generated to design new sign and to have it installed. Report lack of water to home or business. City will investigate and make required repairs. Please check to see if any faucets in building have water, if neighbors have water, or if there is work crew in area that may have shut water off to make repairs. Report discolored water coming from tap or faucet. City will investigate and make required repairs. Please note temporary water discoloration may result from nearby street or water main repair, hydrant flushing, etc. Report water leak in street or sidewalk. City will investigate and make required repairs. Report low water pressure to faucets in your home or business. This is normally caused by water main break, contractors, or open hydrant in your area. Please enter request if condition has existed longer than one day. Water Scout will investigate and work crew will be assigned if conditions warrant. Report missing or damaged water meter cover. Water Scout will investigate and work crew will be assigned if conditions warrant. Report debris remaining from City utility repair (e.g., water, sewer or storm). City will remove debris and clear area. Report opening in street or sidewalk left by Water repair crew. Water & Waste Water’s Construction Repair Crew (or contractors) will assess damage and make necessary repairs.